Today’s WSJ puts us right up there in the top five cities reported to be most attractive to recent college graduates, along with D.C., Seattle, NYC, and Portland: “The Next Hot Youth-Magnet Cities,” byline Sue Shellenbarger, with six panelists involved in the selection. The methodology is explained on line, and the comparative metrics include unemployment rate, cost-of-living index, education levels, and median household income. Of the top five, our cost of living is reported to be the lowest. The reported downside: “Some panelists have doubts about how strongly Austin will rebound after the recession.” The print version is illustrated by a photo of Lucy in Disguise on South Congress. Posted in City Life, News | Comments Off on Austin youth magnet? “From scruffy honky-tonks to slick boutique hotels, Austin walks the line between old school and new” is the subtitle for the three-page article in yesterday’s NYT Sunday style magazine focusing on travel (“Texas Two-Step,” byline Jim Lewis). There are more on-line pix than there were in the print version. As with other pieces of this type, the Austin depicted is not everyone’s Austin, but this article does focus on what’s close in and seems to say “NoCo” to the “SoCo” term, preferring “South Congress” instead. Coming in for a mention I count four lodging establishments (including my old home, the Austin Motel), eight dining establishments, and four clubs and watering holes. Would you recommend the same ones? It’s easy to disagree, but not always easy to come up with a handy list for all those visitors soon to descend upon us. Or perhaps, since it’s the library we’re talking about, we should say “outsourcing to the patron.” At any rate, ever since the central library reopened, the number of clerks has been cut and the number of do-it-yourself stations has been increased. Under the new set-up, Austinites must check out their own DVDs and CDs within a sort of corral and using a patron-operated scanner that doesn’t work with the older cards. Today, we saw several people scampering out of the enclosure and over to the checkout desk that has real people; they did this because their cards, like mine, are useless with the new scanners. Another change instituted between the time the Faulk library closed and the time it reopened, in addition to the security cameras everywhere, was the end of having clerks bring reserved or on-hold items to the checkout desk. They’ve been placed in a bookcase that has only one shelf at a convenient level. The person who placed the hold is required to pull the item from the shelf. The lower the shelf, the more difficult it is to read the name on the slip and the more difficult it is to retrieve the item. I’ve complained every time I’ve seen a person of age down on hands and knees at these shelves. The difficulty is especially great for those wearing skirts. Getting down is not easy; returning to an upright position is beyond the powers of some. Today, I noticed a brand-new and very low scooting stool on casters. This is marginally better, since it eliminates knee-walking, but I still observed people needing assistance to arise. My guess is that I was not the sole complainer about these shelves. Beginning October 1, if on-hold items are not retrieved or cancelled within ten days of notification of their availability, the patron will be assessed a one-dollar fee per item. (That’s fine if the patron receives notification that the item is there, but that is not always the case.) The other change starting on that date is that DVDs and VHS tapes may be borrowed for three weeks and not renewed. 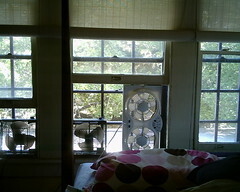 Yes; the fans are still in the windows, and the transoms remain open. But the oxblood lilies have come and gone, and leaves of anemones are beginning to make their appearance. It’s cool enough for the lantanas and the milkweed and the chiles to bloom again profusely. Arising early or retiring very late in order to comply with the watering restrictions is no fun at all, so the downpours have been more welcome than it’s possible to say. Even with the best of efforts, the pleasure grounds have lost two old rose of Sharon shrubs and a good part of a mature redbud tree as a consequence of the summer’s stresses. The City does appear to have spent some effort in enforcing the watering restrictions. Our one watering day under the new regimen has been Saturday, and on one of them, between 6 and 7 am, I observed a City vehicle just creeping along the curb and shining a police-type spotlight over lawns, seeking the telltale glisten of the Secret Soak. There’ve been enough breaks in the heat that we’ve actually fired up the oven. No pizza or loaves of bread or popovers have yet emerged from it, but meatloaf has. We’ve brought out the deep cast-iron pot with the wire basket and enjoyed French fries at breakfast. We used a little of nearly every vegetable to enrich the first Sonoran pork stew of the season, and brought out the comal to heat up Margarita’s tortillas. At this point, I don’t care if I never see a salad again. Food that’s been roasted, fried, baked, boiled, steamed, sauteed, stewed, simmered, broiled, and treated to every sort of application of heat is what I long for. I welcome every harbinger of fall! Posted in City Life | Comments Off on Summer, begone! Three years ago when I move into the Bouldin Neighborhood, there was just the veritable Bouldin Creek Coffee shop on S 1st, and Cafe Caffeine tucked away on W Mary. One winter morning I went to Bouldin Creek Coffee shop after a 50-mile ride and 4-mile run, cold and tired, I made the mistake of ordering a Grande Americano, and the staff made fun of me. I’d waited long enough already and just left, never to return. I walked there early this morning, they have a very straight forward menu, I went for the Cubana cafe au lait Café con leche with codensed milk. They also offer espresso and an iced coffee. I really had no idea what to expect, and what I got took me back to the coffee of the early 1970’s in London. That strange combination of strong, but sweet, and slightly sour. It was in a cup just slightly bigger than a tall cup for a double espresso, had a small foamed head and was resonably hot. At $2.79, if you are a quantity person this wasn’t great value, but as we sat in the front yard of Jovitas and talked, I could indeed imagine being at a street vendor in Havanna or Miami. Mary’s Cubana was on South Lamar, I don’t know if this is the same cabin moved, or a second location. If steamed condensed coffee is your favorite then this is an interesting stop-off. Marys is on the east side of South 1st St, in Jovitas parking lot and is ONLY open from 7am-11am, stop off on your drive downtown! You know how it is, you suffer through a problem for ages, mention it to someone and they say, “oh yeah, I had that, solved it easily”. And so it was with my Time Warner Road runner service. Early this year I started having web browsing problems, often pages would be “not found” and if you hit the refresh button a couple of times, it would work. Funny though as it seemed not to be a connection problem as I could mostly stream the BBC Internet radio without problem. Now it has to be said that OpenDns isn’t without it’s own controversy, if you type a web site name incorrectly, it redirects you to a search engine that makes suggestions. Not a bad idea but had its own drawbacks. To find the most stressful cities we examined quality of life factors in the country’s 40 largest metropolitan statistical areas, or metros — geographic entities defined by the (OMB) for use by federal agencies in collecting, tabulating and publishing federal statistics. We looked at June 2009 unemployment figures provided by the Bureau of Labor and Statistics and cost of living figures from the Council for Community and Economic Research (C2ER). We examined median home price drops from Q1 2008 to Q1 2009 that were provided by the National Association of Realtors. Population density based on 2008 data from the U.S. Census Bureau and ESRI also factored. Last, we examined the number of sunny and partly sunny days per year, based on 2007 data from the National Environmental Satellite, Data and Information Service, as well as air quality figures, based on 2007 data from the US Environmental Protection Agency. Feel free to begin the debate of whether or not any of these measures is a good predictor of stress level for an entire city.